HabitChamp is about forming positive habits and breaking negative ones by tracking your progress. Change your daily routines and form new habits. Report each day whether you succeeded with your habits. Build up streaks of habits and try to keep these streaks alive. All your habits for the day are shown in a list from top to bottom. Different colors symbolize different habit states. Green means the habit is already done. Red implies that the habit is still outstanding. Grey represents an inactive habit for the current day. In addition the blue circle on the left also describes the current habit state. Press the blue circle to change your habits current status. Toggle state between outstanding and done. Swipe right to move into the past. Swipe left to move into the future. Use Home button to jump back to today's date. 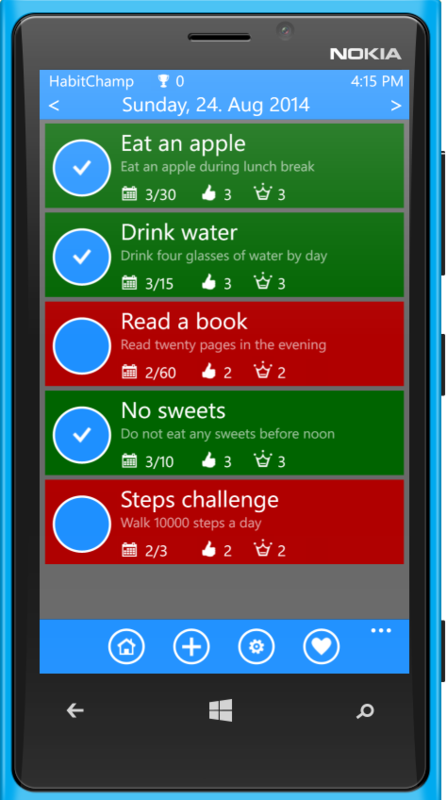 Every habit is described with a blue status circle and three lines of textual information. The first line shows the habit label. The second line displays a longer description. The third line shows various progress information and reminder information if reminder is activated. The number of pending habits can be shown on the lockscreen. The calendar icon shows your total number and your number of days to reach. In Forever-Mode only the number of checked days is shown. The thumbs up icon shows your current streak. The crown icon shows your longest streak. Never forget to check off a pending habit with an activated reminder. A reminder can execute daily or at a specific interval. The reminder for an inactive habit will be automatically suppressed. Every habit has its own reminder. The reminder icons show the current reminder status and time per habit. There are specific reminder status icons for 'executed', 'still pending' or 'skipped'.